With its innovative new crossover yacht the SX88, Sanlorenzo injects its classic flybridge motoryachts with some explorer-class DNA. A masterpiece of innovation, the new SX88 yacht from Italian shipyard Sanlorenzo pushes the boundaries of yacht design in numerous ways. Building on the legacy of Sanlorenzo’s expertise in classic flybridge motoryachts, of which it is a world leader with four models between 27 and 36 metres, the SX88 ups the ante with new features more typical of the increasingly popular explorer class of yachts, of which Sanlorenzo has also shown its mastery with the 42-metre displacement-hulled 460 EXP. The hull of the 27-metre SX88 is made from high-tech GRP with the superstructure in carbon fibre, while an eye-catching superyacht-style single steering position on the flybridge opens up the main deck. Innovation is equally in evidence in the interiors, the work of Italian designer and architect Piero Lissoni, while the exterior design comes from Officina Italiana Design. The first model in a new range from Sanlorenzo, built and assembled in its boatyard in La Spezia, northwestern Italy, the SX88 is exclusively distributed in Asia by Simpson Marine. 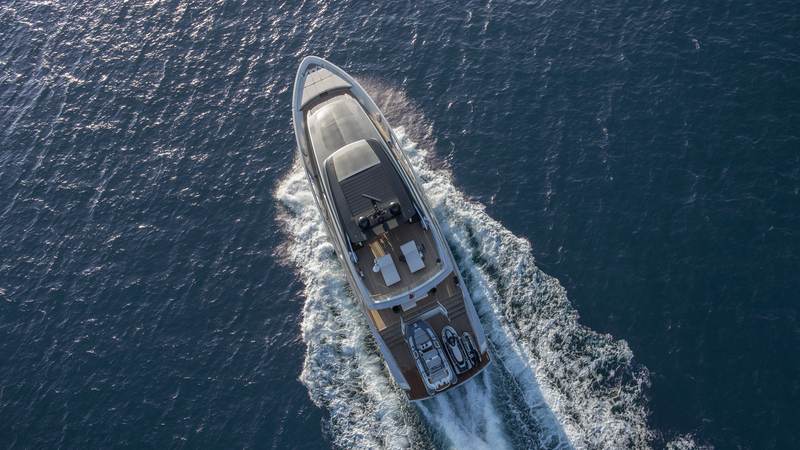 The single steering position, which can be entirely enclosed and air-conditioned, turns the main deck into a single interrupted space from stern to bow, something never before seen on a 27-metre yacht. Alternatively, owners can choose to use the liberated main deck as a giant master cabin, for the first time giving owners control over the master cabin’s location, which in turn gives them the option of anything from three to five cabins on the lower deck; owners can customise their SX88 at every level from the interior layout to the choice of materials. The sense of space is further enhanced by the SX88’s unique interior design. Lissoni and his team set out to design an open boat, picturing it as a loft-like space in which interruptions are kept to a minimum. Wide glass walls facing the sea help to dissolve the boundary between interior and exterior, while a flexible interior layout featuring an open kitchen next to the dining room allows owners to choose from a range of different orientations, from completely open-plan to lightly subdivided. They can further tailor their yacht with furniture that’s arranged freely rather than being designed for specific spaces. The bathrooms and kitchens, meanwhile, were created in partnership with high-end Italian brand Boffi. Equally impressive is the yacht’s stern, featuring an umbrella-shaded 30-square-metre beach area five steps below the main deck that extends 60cm over the water. It can also accommodate a five-metre-long tender as well as other water craft, with the crane to move them cleverly disguised by its integration into the profile of the handrail. Environment sustainability is of paramount importance to Sanlorenzo, and the SX88 is built to the highest green specifications, recognised by a Royal Institution of Naval Architects with Green Class certification award. In particular, the yacht was designed to be sensitive to the environments both where it was built and where it will be used. Its construction process is based on low-environment-impact procedures and materials; while a raft of environmentally friendly features including high-power lithium batteries, low-consumption systems and special new insulating glass in the windows mean that it can run with all its on-board services operating for between four and eight hours at zero emissions. The SX88’s excellence was rewarded with the Most Avant-garde Yacht award at the prestigious World Yacht Trophy, and the recent Christofle Yacht Award for the Best International Yacht Release at the Phuket Rendezvous. Like everyone who owns or uses one, those leading international bodies recognise that the SX88 is a giant leap forward in motor-yacht innovation.